Snowbee also have Rubber Mesh replacement nets available separately. Not only will this allow existing owners of their popular landing nets to up-grade to Rubber-Mesh, but they will also fit most other makes of net. With the increase in catch and release, all landing nets should use knotless net to prevent scale damage. 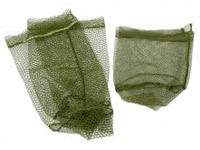 A range of 3 sizes of high quality replacement nets, in Dark Green, 3/4 mesh knotless Nylon. The heavier gauge twine used in these nets is suitable for the largest of salmon while the larger 1½" (half) mesh size gives less resistance in fast flowing Rivers. Will fit any style net, including Gye Nets, up to 30" diametecr. Fits all McLean trout nets.